The TL-EMS series RF switchers are fast and reliable tools for RF/video signal switching applications. They are designed as versatile reception, monitoring, signal distribution and signal testing applications in TV/FM/RF systems. They are controlled by a push button wireless remote control. Custom Switcher configurations and computer GUI control (via RS-232) are optional. 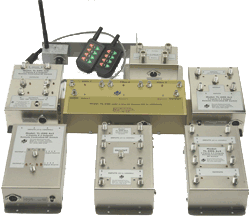 The TL-EMS Series operating bandwidth is DC or 5 to 1000 MHz. Some models are suitable for RF only, whereas others have both RF and composite video switching capabilities. They are available in the following IxO (input x output) configurations* for the 8-button remote control. Select a model from the table below. ** Suitable for security camera video switching. 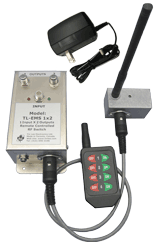 The TL-EMS series is controlled by push button wireless RF remote control, which consists of a general purpose radio frequency (RF) receiver (TL-Rx-315) and a compatible handheld 315 MHz RF transmitter. The TL-EMS RF Switcher is connected to the RF receiver via serial control cable. The TL-Rx-315 receives control signals sent by the remote control, and then transfers them through the control cable to the Switcher. Multiple remote controls can be used in the same control zone provided each transmission is separated by a 2-second time gap. Note: RF signals do not pass through metal obstructions. Avoid placing the TL-Rx-315 near metal obstructions. 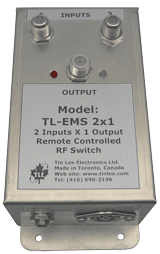 The TL-EMS-1x2 RF switch allows users to direct one input signal to one of two outputs. The input signal frequency range is DC to 1000 (option: DC- 1500 MHz). The Switch is controlled by a hand held RF Transmitter. Control range is up to 100 feet through usual indoor building obstructions. The TL-EMS-1x2 RF switch can be used in reverse, model TL-EMS-2x1, to allow user to select between two input signals and send one through the output. Example residential application: User can select, from a distant room, between two broadband signals, e.g., CATV, TV antenna, connected to Switch at headend. 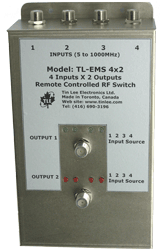 TL-EMS-1x4 allows users to take one input signal and selectively transfer the signal to one of four outputs. 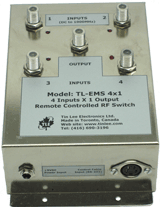 TL-EMS-4x1 allows users to switch between four input signals and transfer it to one output. Bandwidth: DC-1000 MHz (option - DC -1500 MHz).The Switch is controlled by a hand held RF Transmitter. Control range is up to 100 feet through usual indoor building obstructions. TL-EMS-1x4 allows users to take one input signal and selectively transfer the signal to one of four outputs. 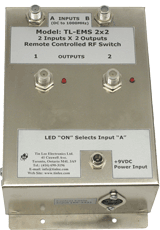 TL-EMS-4x1 allows users to switch between four input signals and transfer it to one output. The Switching is PC controlled via RS232 port. TL-EMS-4-way switches features low thru loss, high port to port isolation, 20 mSec switching speed, and DC-1000 MHz bandwidth (option: DC -1500 MHz). TL-EMS-1x8 allows users to take one input signal and selectively transfer the signal to one of eight outputs. TL-EMS-8x1 allows users to select one of eight input signals and transfer it to one output. These eight-way electronic switches are suitable for RF and video signals. TL-EMS-2x4 is designed for signal distribution applications. It provides two (2) inputs and four (4) outputs. It allows a user to add four outlets to distribution system with two selectable inputs. Each output can select the desired input independent of the other three outputs. Each output will have either input 1 or 2 present. Example application: User can distribute full cable service to four outlets and also switch to local user�s content (e.g., security camera channels, HDTV antenna signal) on a second input. This RF switch is controlled by Hand held transmitter. Up to four TL-EMS-2x4s can be joined to one receiver to provide up to 16 outlets with two selectable inputs. TL-EMS-2x2 is designed for signal distribution applications. It provides two (2) inputs and (2) outputs. It allows a user to add two outlets to distributing system with two selectable inputs. Each output can select the desired input independent of the other output. Each output will have either input 1 or 2 present. It allows a way to select the desired input for each output independent of the other outputs. The TL-EMS-4x2 switcher consists of four (4) inputs and two (2) outputs. It allows users to select one input signal out of four and transfer the signal to one or both outputs, i.e., both outputs can independently select signals from any one of the four inputs. 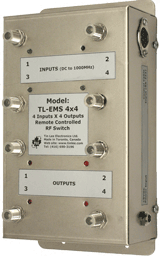 TL-EMS-4x4 is a high performance RF signal switcher. It consists of four (4) inputs and four (4) output ports. It allows a user to select one out of four input signals and send it to one out of four outputs. There is minimal insertion loss (1 dB typical). The TL-EMS-4x4 is controlled using a wireless remote. Custom computer control is optional. Example applications: use in RF test system to select signal from multiple sources to multiple test devices. The TL-EMS-BPx1 is a high performance RF signal bypass switch. It allows a user to select between bringing an RF device in-line and off-line (bypass). It consists of four (4) ports (RF in & out; Bypass in & out). In the Off-line mode, the Input signal passes directly through RF input and RF output ports. In the In-line mode, the input signal will pass the device connected to the Bypass ports. The TL-EMS-BPx1 features low insertion loss (.75 dB typical) and 20mS switching speed. In the on-line mode, The TL-EMS-BPx1 can be controlled using a hand held transmitter, or, PC RS-232 control (TL-EMS-BPx1-PC). Example applications: use in RF test system to compare the effect of RF device in-line and off-line; use in signal distribution system to select or de-select an in-line RF device , such as, a filter or trap. The TL-EMS-BPx1 is suitable for RF and composite video signals. TL-EMS-BPx2 is a high performance RF signal bypass switcher. It allows a user to select between bringing two (2) separate RF devices on-line and off-line (bypass). It consists of input and output ports and three sets of �device-on-line� ports. In the off-line mode, the original input signal will pass directly through input and output ports, with minimal insertion loss (.75 dB typical). In the on-line mode, the input signal will pass through any one or all of the device(s) connected to the �device on-line� ports. The TL-EMS-BPx2 is controlled using a wireless remote. Custom computer control is optional. Example applications: use in RF test system to compare the effect of RF device in-line and off-line; use in signal distribution systems to modify signal to select or de-select one, two or both in-line RF devices, such as filters. The TL-EMS-BPx2 is suitable for RF and composite video signals. 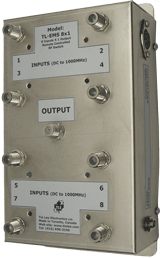 TL-EMS-BPx3 is a high performance RF signal bypass switcher. It allows a user to select between bringing three (3) separate RF devices in-line and off-line (bypass). It consists of input and output ports and three sets of �device-on-line� ports. In the off-line mode, the original input signal will pass directly through input and output ports, with minimal insertion loss (.75 dB typical). In the on-line mode, the input signal will pass through any one or all of the device(s) connected to the �device on-line� ports. 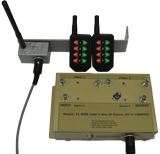 The TL-EMS-BPx3 is controlled using a wireless remote. Custom computer control is optional. Example applications: use in RF test system to compare the effect of inserting RF devices in-line and off-line; use in signal distribution systems to modify signal to select or de-select one, two, or all three in-line RF devices, such as filters. The TL-EMS-BPx1 is suitable for RF and composite video signals.